"The Wakefield Lodge of Elks dedicated its 'handsome new home at Lakeside' on May 20, 1914. The festivities were attended by approximately 200 Wakefield and out-of-town members of the order. The festivities were led by Ex-mayor Charles Barton of Melrose, deputy grand exalted ruler of the district. Following the dedication ceremonies, the visiting officers were entertained on the third floor of the home, while the members and other guests retreated to the large stable which was later to become a lodge room. The Elks' Home was formerly the Fitz residence. The organization had its home on Main Street until 1956." -- Text from calendar by Jayne M. D'Onofrio. 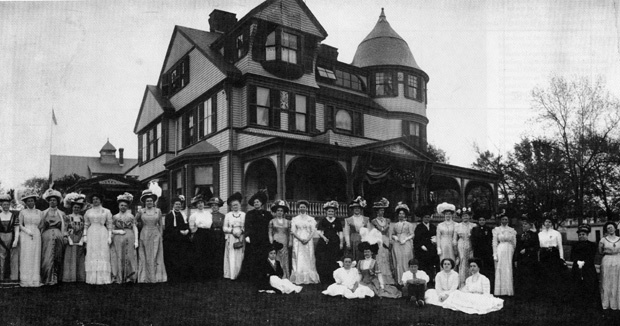 “Ladies' Day at the Wakefield Elks Home, circa 1915,” NOBLE Digital Heritage, accessed April 20, 2019, https://digitalheritage.noblenet.org/noble/items/show/7000.